Have you ever tried to stabilize your shaky footage from GoPro, iPhone, drones for sharing to YouTube? You're not alone. You used to be able to achieve it by YouTube Video Editor (Enhancements since Sept 2017). But as of August 22, 2018, it's discontinued and a new service named YouTube Studio emerged as a replacement, which continues some of the existing Enhancements features while discards the not frequently used ones. You see, unfortunately, video stabilization is no longer available on YouTube Studio. Then how can you stabilize shaky 4K, 1080p/720p HD footage for uploading to YouTube? A professional YouTube video stabilizer, VideoProc could give you a super fix for video shakiness! - Stabilize shaky camera footage from GoPro, drones, iPhone or Android mobiles within a few clicks. - Simple and rich editing features (cut, crop, rotate, subtitle, effect etc.) and complete toolbox. - Output optimal video quality with minimal image cropping and almost no frames loss. - Full GPU acceleration boost 4K, 1080p/720p HD video processing speed up to 47x real-time faster. - Available to any footages, say 4K/1080p MP4, AVI, MKV, and HEVC, and more. It's inevitable that video stabilization will lead to a image cropping. But comparing to other easy video editors and the built-in stabilization of GoPro, iPhone, drones, VideoProc crops the least edge of your shaky footage. It works in a perfect workflow to fix video shakiness, namely analyze original video, track motion vectors, get absolute motion vectors, move the entire frame and get a relatively stable footage of the subject through motion compensation. 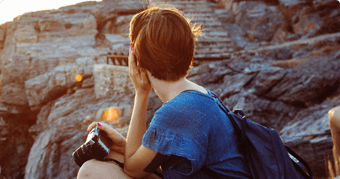 But it doesn't mean you need stabilize your camera footage with complicated procedures. Instead, it can be done easily, merely within steps. At the very beginning, download and install the YouTube video stabilizer on Windows or MacOS according to your computer platform. Then launch it. Step 1: Import the shaky source video to the program. Tap the Video button to get an access to video processing interface. Then click +Video button on the top panel to load your source video from your computer hard drive. You can add more than one clip at a time. Meanwhile, drag-n-drop is also available to do that. Step 2: Navigate to Deshake option. Click ToolBox column at the bottom panel and find Deshake, double click it to access a new window for video stabilization settings. 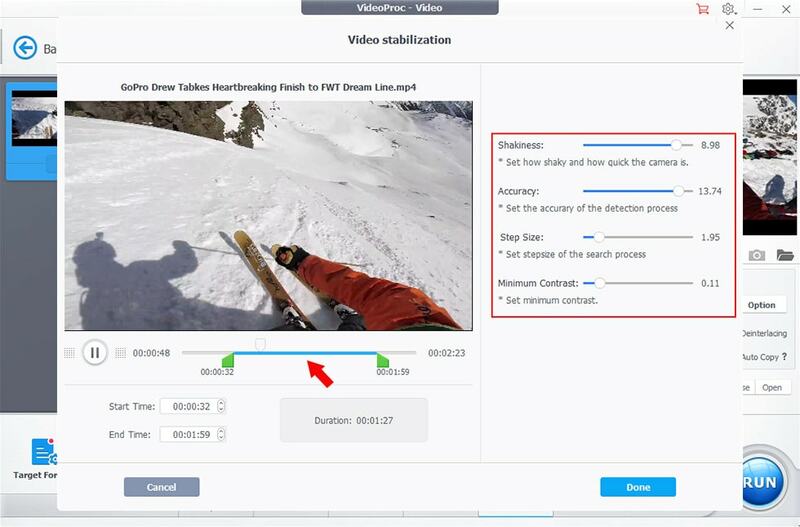 Step 3: Tweak video stabilization settings for best result. The video stabilization window can be divided into three parts for trimming video, for adjusting stabilization parameters, and for previewing the final result. Apparently, you can drag the green knobs to cut the video clip and it needs no further ado. As for stabilization, four parameters needs to be considered, namely Shakiness, Accuracy, Step Size and Minimum Contrast. Here are some suggestions for tweaking such settings. It depends on the shake frequencies of your source video. If it's wiggling too fast, you can turn the shakiness up. The higher the value is, the more accurate the match will be. It also means more time for detection and matching, causing a slower video processing speed. Vice versa. The lower the value is, the smaller the range of searching identified macroblocks will be, and the more detailed the result will be. The smaller the value is, the higher the output quality. Higher value means faster processing yet poorer quality, omitting the darker blocks below the value you set. The exact value varies in different footage. 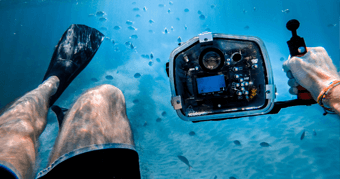 But generally, you're suggested to tweak Shakiness and Accuracy at higher value, while lower for Step Size and Minimum Contrast to deshake 4K, slo-mo, time-lapse sports videos. Of course, knowledge comes from experience. Just turn up and down each value to achieve the best result in preview. After all done, click Done button to make your settings valid. Click Browse button to save your deshaked video to a destination where you like. Hit RUN button at the lower right corner to start eliminate the shakiness of your footage from GoPro, iPhone, drones and so on. 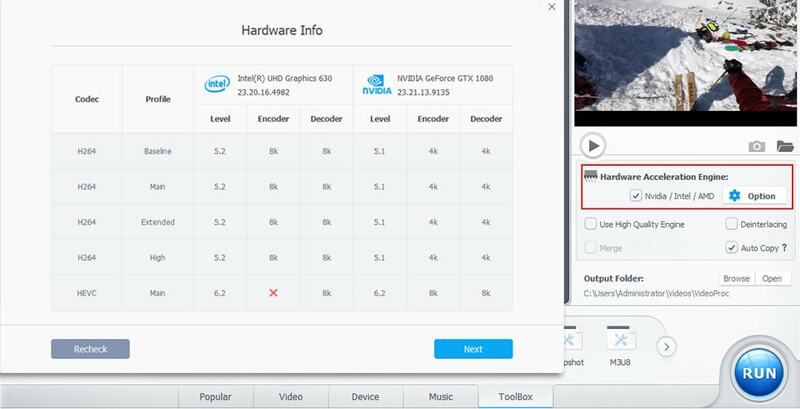 It's worth noting that if your computer is built in with hardware supported GPUs, VideoProc will automatically invoke full GPU hardware acceleration tech, which lowers the CPU usage to 40% and boosts your video processing up to 47x real-time faster. If not, manually tick the box of Nvidia/Intel/AMD. You can also check your computer hardware info by clicking Option button. Comparing to deshake videos in post-production, it will be handier and more fascinating to upload your footage to YouTube if you can get a stable video while shooting. For that, here are several tips to shoot your video more stable. There are various accessories for video stabilization, from gimbal, tripod, to rig etc., which help you shoot videos in a stabler mode indeed. While at the same time it will cost you a lot. Certainly, there are free ways that you can mount your camera on a chicken as they have an uncanny ability to keep their heads steady. Or you can also bite your camera. Obviously, both ways sound inflexible and unavailable in some situations. Some cameras like GoPro, drones, iPhone and Android phones are built in with stabilization mechanism. Take GoPro as an example, you can turn on the stabilization when you're shooting since GoPro HERO5. And it absolutely works for get a stable video, yet it's not as stable as using a tripod. Fortunately, this technology makes unceasing progress, leading to a super-stabilised HyperSmooth mode in GoPro HERO7. 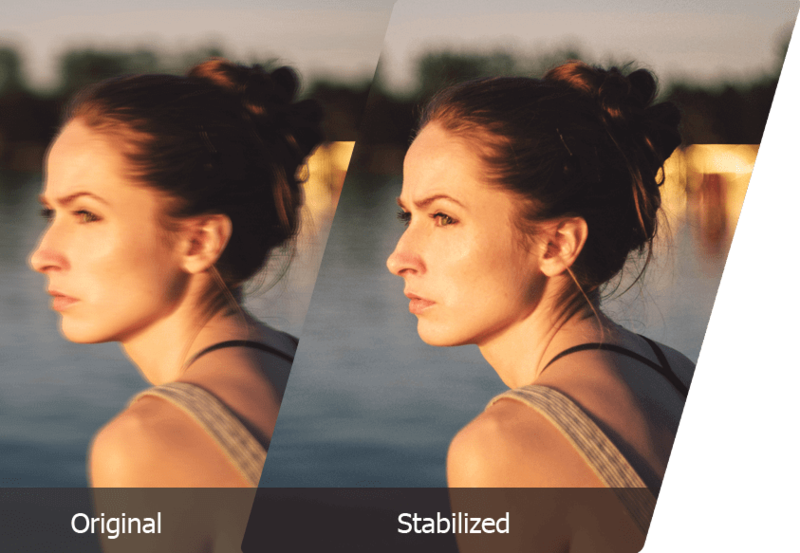 However, it's not always perfect as this feature is not available for 4K video higher than 30fps and you cannot preset or adjust the stabilization value. Worse still, GoPro HERO5 will cause about 10% edge cropping with stabilization enabled, while 5% for GoPro HERO6. Thus to get a stable camera footage for sharing to YouTube, you're suggested to shooting a stable footage with accessories or built-in stabilization if possible. Whereas, if they aren't available, go ahead to shoot your 4K 60FPS UHD, time-lapse, slow motion videos and stabilize your camera footage with VideoProc! 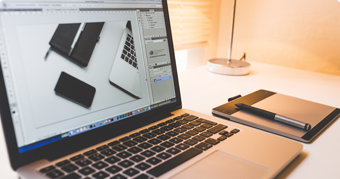 Compress Video File Size by up to 90% with No Quality Loss.